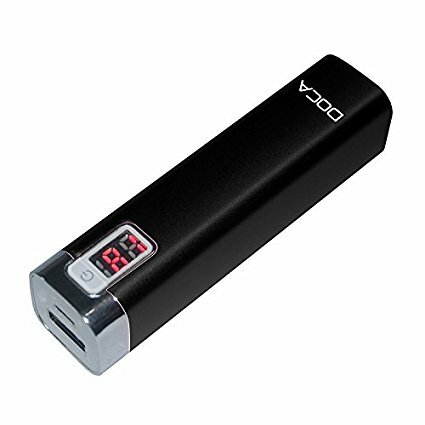 If the weight of your portable charger counts for you, then this choice is a great solution for you. Very low weight and small dimensions make you do not even feel like you have this battery with you. We recommend it especially to people who usually have access to network chargers or a computer, but they also have situations where they lack energy in the phone. Half poverty, if you do not need to urgently need to call or check something online. On the other hand, there are situations in life that you must necessarily contact someone or something to check. For this type of situation this DOCA is a great solution. It was not built to charge your phone several times. Unfortunately, this power bank is not for this type of operation, because the capacity of this device does not allow for such an application. The device has an extremely simple energy information system. This device can also be useful to people who need to pay attention to the weight. This group includes athletes, runners, cyclists or similar sports. Professional powerbanki with small capacities. Once upon a time (sounds like a fairy tale, but it's not) as I was running a bit, I loved listening to music or audiobooks from mp3s. My choice fell on mp3 rather than on the phone for several reasons. Firstly, when I was running, it was not as smart as smartphones, and secondly the mp3 was much lighter than a phone. It was a very cool feeling for a runner as he traveled the kilometers in beautiful surroundings. I also ran distance 10 kilometers. The music that I heard in the receiver added energy, I could also learn listening to very interesting audiobooks. On the other hand, I was very upset when, during a great effort, sometimes I was climbing on quite steep hills, was when suddenly I turned off the mp3, no power. Of course there is no problem with mp3s at all, but it is worth to have a mobile battery, which is power bank to, for example, already on the way to recharge mp3. I would like to recommend this type of equipment he will certainly make your life easier.